How can I combine two identical photos with different exposures? Q: I've heard it's possible to combine a photo exposed for the light colored sky with an identical photo exposed for the dark colored foreground, using layers in Elements. In other words, a correctly exposed photo without HDR. Is this possible? Open the first photo in Elements, the one you want to use for the Foreground. Open the second photo for the sky in Elements and drag the Background Layer onto the first photo. It will become Layer 1 in the Layers palette. Now close the second photo you opened (for the sky). You now have one photo open in Elements with 2 Layers. Now we will use a Layer Mask on Layer 1 to mask out the foreground. 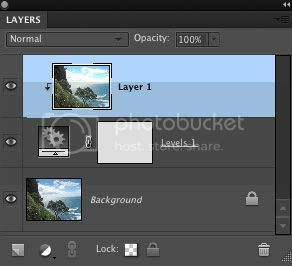 Make sure your Background Layer is active by clicking on it. Click on the half white/half gray circle in the Layers palette to show the drop-down menu for creating an Adjustment Layer and choose Levels…. 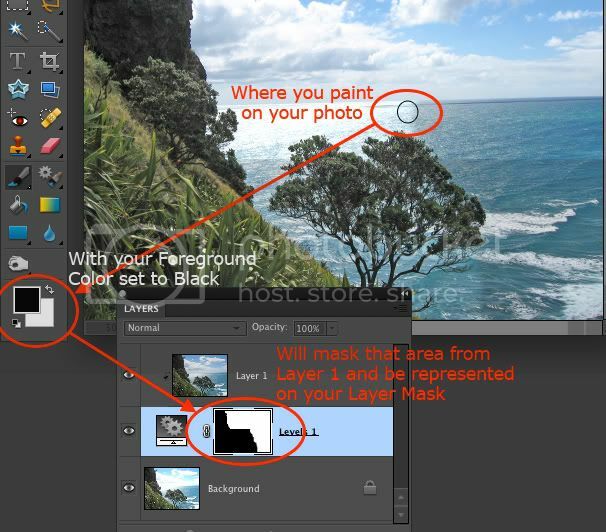 Layer Mask) in your Layers palette. 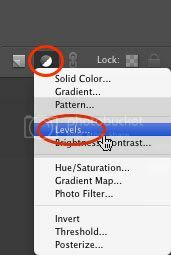 Click and drag your Levels Adjustment Layer so that it's below Layer 1 in the Layers palette. Click on Layer 1 in the Layers palette to make it active. Go up to the Layer menu and choose Create Clipping Mask. Layer 1 will shift over to the right and a 90° down-facing arrow will appear to the left of it as shown below. Click on the Levels Adjustment Layer to make it active. Click on the Brush Tool from the Toolbox and make sure your Foreground Color (the big front square overlapping the other big square located at the bottom of the Toolbox) is set to Black by pressing the letter D. Now just paint over the foreground area of your photo. That will mask it out of your Sky Layer and allow it to show through from the Background Layer. If you go too far and paint out some of the Sky area, just switch your Foreground Color to white by pressing the letter X on your keyboard. That toggles between the Foreground and Background colors. And now you can paint over the Sky area with white to bring it back. After you get it back to where you want it, press X again to toggle your Foreground color to Black and continue painting your mask. Working with Layers and Layer Masks can be a difficult concept to grasp. But keep trying because it's essential to know if you want to get the most out of Elements. Comments for How can I combine two identical photos with different exposures? Thanks Rick! Exactly what I was looking for. I can't wait to try it! Thank you very much. You wouldn't believe how many times I've searched for an easy way to do this! Your instructions are at just the right level and really well explained. Thanks for going to the effort of posting - really appreciated. Thank you so much for your clear, precise instruction - even I can follow you!!! I love your website and I so appreciate your efforts. Your directions are awesome. You make learning all of this so fun! Thanks.